This KFC fried chicken recipe I have here is a copy cat version of the original. Although this might not taste exactly as the original, it is close enough. But maybe this will taste better than the one you buy in fast food chains because the last one I ate if my memory serves me right, is not so good because it was not cooked well. Anyway I think if you want to cook your own, you can also experiment by adjusting the amount of spices in this recipe to suit your taste. To cook homemade KFC fried chicken; Wash your favorite chicken pieces and drain in a colander. Let it stay in the colander until the chicken is pat dry. To make the coating, in a mixing bowl, combine flour, salt, ground pepper, garlic powder, onion powder and paprika powder. Set aside. In another bowl, to make the egg wash combine egg and milk and whisk to blend. Set aside. Get you chicken pieces and dip one piece in the egg wash, coat it well then put it in the flour mix and make sure it is also well coated. Remove it from the four mix and shake off the excess flour then dip it back in the egg wash coat it well then back into the flour mix and coat well. This KFC fried chicken recipe I have here is a copy cat version of the original. Although this might not taste exactly as the original, it is close enough. Wash your favorite chicken pieces and drain in a colander. Let it stay in the colander until the chicken is pat dry. To make the coating, in a mixing bowl, combine flour, salt, ground pepper, garlic powder, onion powder and paprika powder. Set aside. In another bowl, to make the egg wash combine egg and milk and whisk to blend. Set aside. Get you chicken pieces and dip one piece in the egg wash, coat it well then put it in the flour mix and make sure it is also well coated. Remove it from the four mix and shake off the excess flour then dip it back in the egg wash coat it well then back into the flour mix and coat well. Do the same with the rest of the chicken pieces and put it in a tray or a large plate to be fried later. Prepare a deep pan, a non-stick pan if available and put enough cooking oil just to cover the chicken. Heat it until it shimmers but don't let it smoke. If you have a thermometer, heat it up for about 175 °C. Then carefully put each chicken pieces in the pan and let enough space for each chicken pieces. Don't overcrowd them. Cook for about 25 to 30 minutes in medium heat turning and flipping occasionally. Then drain the excess oil from the chicken by placing it on paper towels. Serve with your favorite gravy and french fried. Enjoy! 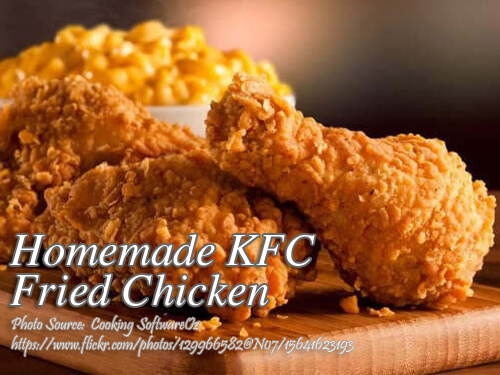 Thanks for this home made KFC recipe! Hi Sharlene, You are welcome!